(MP509). Alma Claude Burlton Cull (1880-1931). Watercolour signed and dated '13. On the occasion of the visit to Grear Britain of the French Republic's President, Monsieur Raymond Poincare, in June 1913, the three Orion class dreadnoughts HM Ships MONARCH, THUNDERER and ORION of the 2nd Battle Squadron, Home Fleet, were at Spithead on 24th June formally to greet him. So was Alma Claude Burlton Cull who has painted this lively watercolour of the scene! From Spithead M.Poincare and his entourage, accompanied by the Commander-in-Chief Portsmouth, went by admiral's barge to Portsmouth Harbour railway station. Here they were met by those from Buckingham Palace attached to his suite for the duration of the visit who accompanied the French delegation to London for their official business, a call on HM The King followed by meetings in Downing Street with the Prime Minister and the Foreign Secretary. 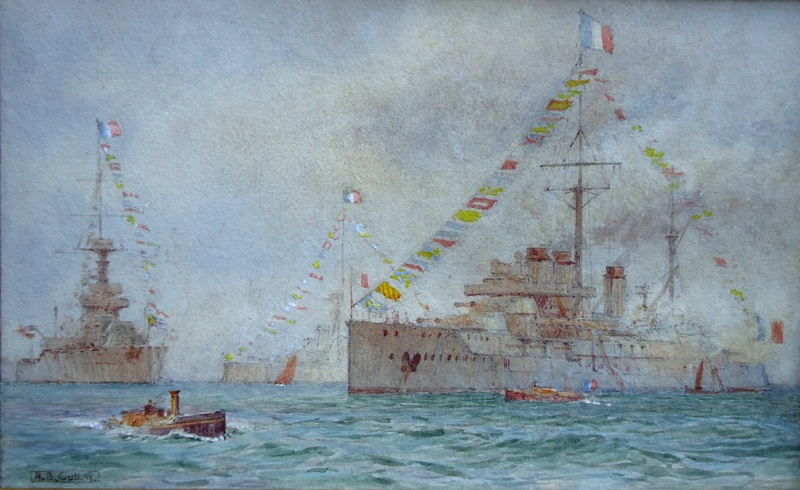 Alma Cull has executed a fine and detailed watercolour with a wide ranging palette of colours; and it's an excellent record of events out in the Solent all those years ago.